Warning, the following contains SPOILERS for The Fury of Firestorm: The Nuclear Men #19. The Fury of Firestorm: The Nuclear Man #19 goes on sale tomorrow! Check out the surprise “WTF” gatefold cover below! Click to enlarge! Typhoon, Black Bison, Multiplex, Killer Frost, Hyena, and Plastique (presumably)!?!?!? It’s a Match-head’s dream rogues gallery! Now… if only Slipknot were there too! Looks like Dan Jurgens managed to give us the majority of the classic rogues just before cancellation! Thanks, Dan! If you can’t wait until tomorrow, head over to Science Fiction.com to check out a five page preview right now! Click here to check it out! This issue features story and pencils by Dan Jurgens, finished ink art by Ray McCarthy & Karl Kesel, and colors by Hi-Fi! Let’s get out there and show our support for Firestorm! There may only be two issues left, but let’s make sure the title goes out on a high note! 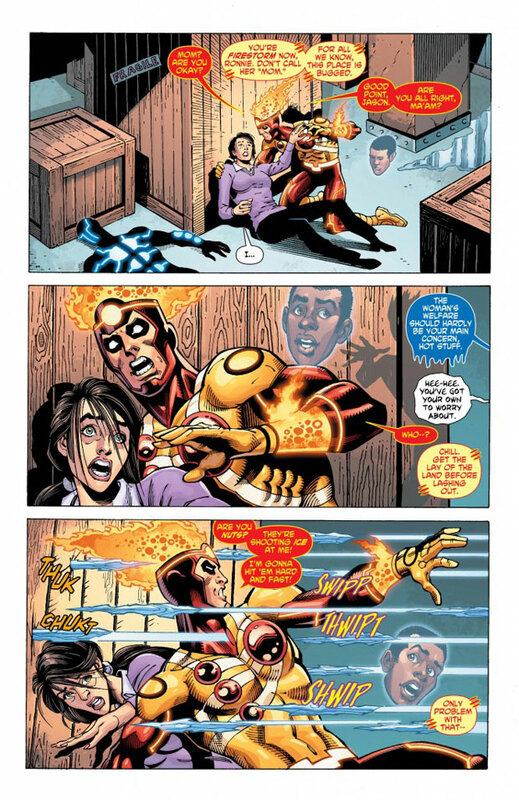 The story picks up right after Firestorm freed Ronnie’s mom! Be sure to buy a copy tomorrow and tell your friends to also! Below are a few pages from the preview. Be sure to visit Science Fiction.com to see all five preview pages! Don’t forget, pick up your copy of The Fury of Firestorm: The Nuclear Man #19 tomorrow! Posted in: Dan Jurgens, Firestorm #10: New 52 v2 (Ronnie/Jason), Firestorm comic vol. IV, Killer Frost, Rogues Gallery. Wow, very surprised to see TYPHOON make the cut. But very happy as well! I always love the trope of “the entire old school Rogues Gallery shows up” and this looks like it does a good job of it! I find thus depressing, actually. 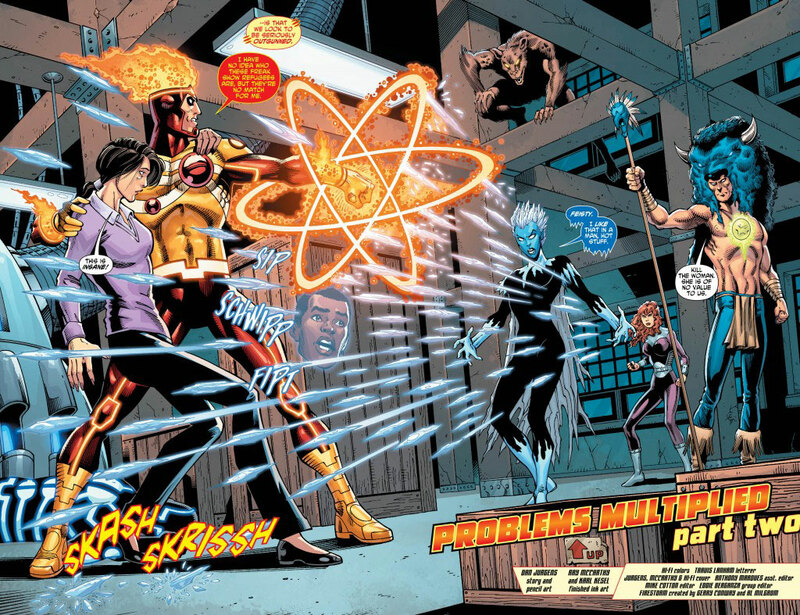 I mock the Firestorm rogues gallery because they deserve it, but I never advocate for wallowing in $#!+. The New 52 would ideally be a place where creators took a Julie Schwartz approach to Post-Crisis continuity, especially the creator who spearheaded Tangent Comics better than a decade ago. Take the name and some essential attributes of dated, risible characters and find a bold, effective new approach. Reinvent Black Bison as a sort of Native American minotaur of enormous supernatural power and intrigue. Make the Hyena a rogue Firestorm protocol; a cackling Kim Jong-un relishing gleefully the extortion of power and money from the world by being a living, breathing nuke threat. Or, you know, just not giving Killer Frost easily her lousiest, least imaginative costume ever and casting her lot with the bottom feeders she managed to avoid being associated with for three decades. Some creators lob a hand grenade at a project counting down to doom as a Hail Mary pass or final opportunity at creative innovation, but Dan’s just offering hand jobs to the graying faithful instead. Also, no Slipknot. Gratuitous vulgarity aside, I think you are missing the point, Frank. It is demonstrable that whatever happens in these cancelled books will be completely and utterly forgotten immediately after they are published. So why waste a potentially good idea for a new character on a book with no future? As a writer you are better off keeping that idea to yourself and use it on a project which is not a lame duck. I applaud Jurgens for at least giving the fans who have stuck with the book a little bit of fun in the form of the old rogues. 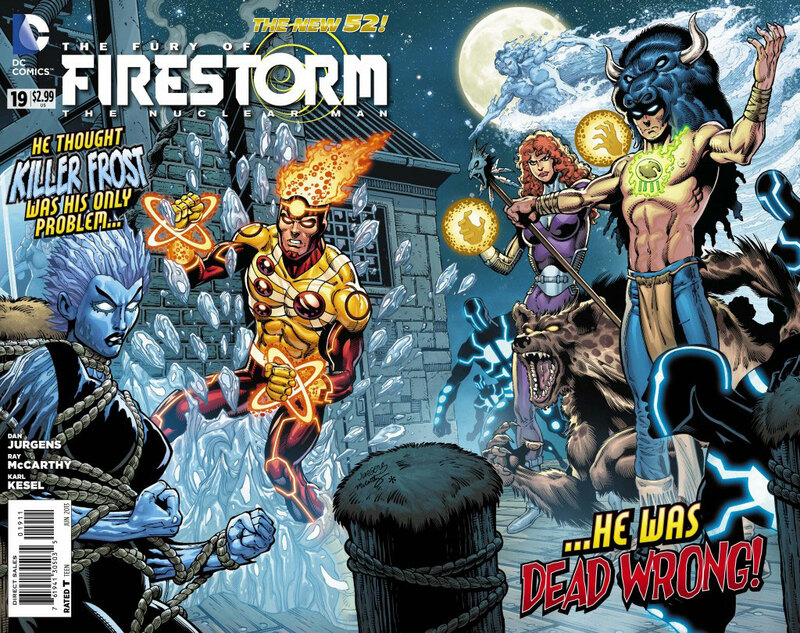 I agree this is a temporary little nod to long-suffering Firestorm fans but I’m a bit torn on Killer Frost. It’s not the most creative look, in fact she looks like a frozen version of Firehawk in her second costume from the 90s. I have no problem with reimagining classic characters. They’ve finally got a good blend of old and new for Firestorm himself, and Multiplex looks cool (while I liked his old costume, it looks quite dated now). I agree with Luke, Dan Jurgens is giving us what we wanted in the second-to-last issue. I am not a fan of the Killer Frost costume, but I always liked the very first version in the “Mrs Cleever From Hell” look best. I liked this, it was probably the most “true” to the characters in the entire run IMHO.